Part of the appeal of the anthology series The Twilight Zone is the way in which the show constantly challenged the normalcy of the everyday experience with visions of the bizarre and instilling feelings of uncertainty in the viewer. Any composer composing music would have felt a level of freedom to experiment and explore a variety of musical styles and unorthodox orchestrations. Examination of the film music, Bernard Herrmann seemed to be especially inspired by themes of loneliness, isolation and alienation. Prior to working on The Twilight Zone, Herrmann had been involved in composing library music for CBS Television and had already made his name several years previously, scoring for radio dramas; often composing powerful compositions usually with unusual orchestrations. The choice of Herrmann for main theme of The Twilight Zone and the pilot episode “Where Is Everybody?” was an obvious one. 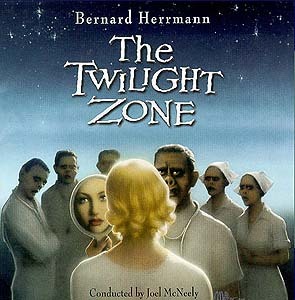 Varese’s 2-CD set of Herrmann’s music for The Twilight Zone features several variations of the original title and credits music as well as complete scores for seven episodes (each approximately 23-minute episode featured between about 12-19 minutes of music.) Herrmann composes a main theme that is the complete opposite of Marius Constant’s later and more familiar ostinato-driven theme; Herrmann goes instead for a slow, undulating theme more suggestive of tension, menace and a feeling of otherworldliness or alternate worlds. And his theme is very suggestive of the style for the TV show scores themselves. In his Twilight Zone scores, like many of his movie scores, Herrmann takes small ideas and plays with them; passing them between the various sections of the ensemble players, mutating the motifs/devices he has come up with and at the same time developing the ideas, where necessary, as the on-screen drama develops. The use of small-scale musical devices is ideal for this TV show as each show lasted only just over 20 minutes; little time to develop more conventional, extended themes. At least five of the episodes that Herrmann scored deals with various aspects of isolation: “Where Is Everybody?” (CD1 tracks 2-17), “Walking Distance” (CD1 tracks 18-28), “The Lonely” (CD1 tracks 29-39), “Eye of The Beholder” (CD1 tracks 40-51) and “Little Girl Lost” (CD2 tracks 2-12). Recorded at the beginning of 1959 – just four days before Herrmann would begin composing music for Vertigo – “Where Is Everybody?” is a score for small orchestra that is dominated by a 3-note device that is passed between several sections of the orchestra. It’s an atmospheric score that succeeds in generating feelings of loneliness and mental anguish. Both “Eye of the Beholder” and “Little Girl Lost” are also very atmospheric scores, and again use the technique of motif repetition with numerous variations to establish the feel of the scores. “Eye of The Beholder” (scored for brass, harps, vibraphone and percussion) features a sparse score dominated by an unvarying ostinato for harp and vibraphone and a single, sinister motivic device for low brass. “Little Girl Lost” (scored for four flutes, four harps, viola d’amore and percussion) also ignores the development of musical ideas and, instead, provides colour and mood with its constantly shifting pizzicato harps (that are very reminiscent of Herrmann’s use of harps in his score Beneath The 12-Mile Reef) and repetitive flutes. Herrmann’s remaining scores for these episodes that deal with isolation develop in a more narrative fashion. Scored for brass, Hammond organ, harps and vibraphone, “The Lonely” is a score where Herrmann has to establish very quickly both the strange setting of the drama (an asteroid prison) and that this is actually a love story. Cues such as “Mockery” and “Stars” are very lyrical cues, emphasising the developing emotions of love between the main characters. “Walking Distance” – frequently cited as one of Herrmann’s best scores for the series – is one of his more conventional scores; another lyrical and sentimental score for strings, harps and vibraphone. “Elegy” is a wondrous requiem for violas and cellos. The score for “Living Doll” (CD2 tracks 13-27) – one of the highlight selections – is an out-and-out horror piece and Herrmann’s orchestration of bass clarinet, 2 harps and celeste (his sparsest orchestration of the series) manages to produce a nightmarish score. A menacing and sinister line for bass clarinet is placed up against a macabre waltz for harps and celeste – mimicking the mechanical movements of the “Living Doll.” The final score of the set, “Ninety Years of Slumbering” (CD2 tracks 28-40) has a more conventional feel in comparison with the other scores (though it is orchestrated for winds, harp and vibraphone) and is based upon a traditional melody. With this episode having a theme revolving around the passage of time, Herrmann decides to emphasise the importance of the tempo of the music just as much as any theme or orchestrational device. As a result, the music is slow and lumbering – mimicking the pendulum swing of the grandfather clock featured in the storyline. This slow and lumbering feel to this score, unfortunately gives a bit of an anti-climactic feel to the whole listening experience – a decision to position the scores chronologically rather than for the most satisfying listening experience. The recording is superb with the close-miking meaning that there is a good separation of the sound that shows off Herrmann’s wonderfully appropriate orchestrational choices. Recorded over three days at the world-famous Abbey Road Studios in London, McNeely’s interpretation is in the main very good, though there has been some criticism from various quarters more familiar with the original scores that McNeely tends to stretch out the music which results in a more drawn out, less emotional sound. But, for anyone who is relatively unfamiliar with the originals (as I am), this is not much of an issue. For fans of Bernard Herrmann’s work this two CD set is an obvious must-have purchase. For the more general listener though, the repetitious nature of Herrmann’s music will probably annoy rather than generate any feelings of admiration. Bernard Herrmann’s music for The Twilight Zone did so much to help create the feel of the TV show and this Varese release is a wonderful advert for how Herrmann achieved this through his music. I have to agree that this particular CD set is not for the average soundtrack listener and is really only for the fan of Herrmann.